At this year’s annual meeting it was agreed to make donations of £350 each to Whizz Kidz and Combat Stress. Letters of thanks from the two charities can be found below. Please click here to read the article about the visit. Please follow this link to read the article. In his article for this year’s Newsletter, the Grand Master, M.E. The Chevalier Howard Doe, announced his intention to retire as Grand Master in 2016. A special Ceremony has been arranged to install the new Grand Master, although his name will not be announced until the Annual Meeting in May 2016. The Installation service will take place at Rugeley, Staffordshire, on Sunday 21st August 2016, and promises to be a unique event in the history of the Order. Details have been sent to all members of the Order, and it is hoped that most members will be able to attend. For further information please contact the Grand Chancellor. A meeting was held on the 8th August 2015 at the Civil Service Club, London, for an Investiture service and for the re-dedication of the Conclave of St Thomas Becket – Martyr. Although the ‘home’ of the conclave is St. Mary’s church, Putney High Street (Next to the river Thames by the stone Bridge), London SW15 1SN, this was unavailable on the day. The Grand Conclave was opened in the customary manner, led by the Grand Master, Grand Prior and Grand Chancellor. Members in attendance were ; Howard Doe, Grand Master, Barry Uttley, Grand Chancellor, David Haywood, Grand Chancellor Designate, Rt Rev’d Geoffrey Robinson, Grand Prior, Steven Turner, Norman Offield, Elizabeth Murray, Mike Boxall, Simon McIlwaine, Lawrence and Penny Bell-Wright and Ian Tough. At this time there was one Postulant – Andrew Charalambous, who was invested as a Knight of the Order. The Grand Master re-dedicated the St Thomas Beckett – Martyr Conclave, with Norman Offield being appointed as the first Commander. The Conclave was closed in traditional form, and those present retired for a banquet in the bar, where some suitable toasts were proposed and speeches given. Norman Offield will give notice of the next meeting of the Conclave in Putney, after speaking to the Rector in charge of St.Mary’s church. Photos from the event can be found in the Gallery. The Annual Investiture of the Order took place on Saturday 9th May 2015 at the Masonic Centre, Ellindon, Bretton, Peterborough, PE3 8RD. 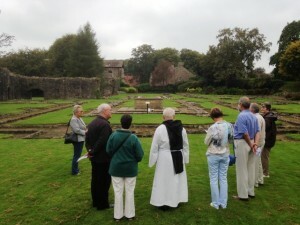 Following recent tradition several members of the St. Martin’s Conclave met for an informal social event which included a guided tour of the atmospheric Whalley Abbey. Members met in the car park to the Abbey which is entered through an impressive gateway suitable for a building of such importance. Members were taken on a guided tour of the site, much of which is in ruins, although there are still several majestic walls and arches which remain to indicate the splendour of the building. Whalley Abbey was founded in 1296 by monks from Stanlow in Cheshire. Although a substantial building with a hospice/infirmary and large kitchens, only 30 monks and around 90 lay brothers actually lived there. The site contains examples of Gothic, Medieval, Tudor and even Victorian architecture as renovations have been made. 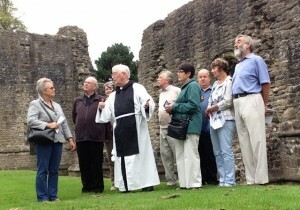 The Guide was informative and interesting as well as humorous and obviously had a love of the Abbey. Following the visit to the Abbey, members enjoyed a lunch together in a nearby hotel before visiting the local Churchyard with a view to touring the inside of the church when it opened later that afternoon. Regretfully, the church was not opened to the public for some unexplained reason so that part of the visit was concluded by having a short service of contemplation in the churchyard. 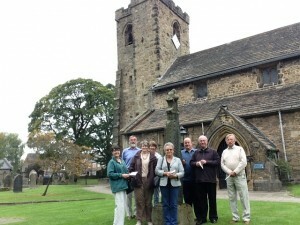 Members stood around a Celtic cross (one of three in the churchyard) and the Grand Prior led members in the ‘Service of the Crosses’. The visit concluded with members having afternoon tea together in the town of Clitheroe before making their various ways home after thanking David Haywood for organising the event. The day proved to be one of education, pleasure, spiritual contemplation and friendship which was much enjoyed by all. Elaine went to Bamberg in Germany to represent the Order of St. Raphael at a meeting of the Orden der Ritter vom Stern und der Freundschaft. I went to keep her company and went in my other guise, as a humble knight of the Schwertritter von Livland. We arrived in Bamberg on the Thursday evening, so had all of Friday to explore, and what a beautiful and interesting town it is. We were received with great hospitality, and enjoyed a social evening with Germans, Belgians and Swiss at a rustic restaurant, with good food and interesting beers. Saturday was given over to more exploring and a river cruise before the evening’s formalities. After a one hour session which we couldn’t understand, but involved some devotions followed by a dubbing, we proceeded to the banquet. Elaine was according the title of Ihre Excellenze Lady Elaine, meaning her excellency. Not sure she’s entitled to that, but didn’t complain. We were presented with a bottle of Sekt (German sparkling wine) with bits of gold leaf in it. We were told to make sure we drank the gold as it would be good for us. Having arrived by a flight from Aberdeen to Frankfurt, and having taken the train from there to Bamberg, we had a problem on the Sunday morning as the train drivers went on strike. We were over 100 miles from the airport, so a taxi would have been a tad pricey. Thankfully one of the Belgian knights said his route home went passed the airport and he gave us a lift there, where we arrived at 12:30 for a 16:15 flight. On checking in, it turned out the flight was over booked, and we got bumped back to the 21:15 flight. We consoled ourselves with a rather good meal taken at a leisurely pace. I thought our troubles were over, but the incoming flight from Marseilles was delayed. This had two possible consequences. The first was that Aberdeen might close the airport and divert us to Edinburgh if we were too late – they used to do that, but it transpires, no longer. The second hazard was that if we didn’t get away soon, we would get caught up in a pilots’ strike. However, we got away at 22:15 and landed in Aberdeen at 23:00, ready to drive home at last. Our flights had cost about £194, but of that only £22 was air fare and the rest was taxes! So for £5.50 each, each way, we got to Germany, and we got food, tea or coffee, and an alcoholic beverage! And then for compensation for the seats being full, they gave us back £197 each. Can’t complain! Now I’ve just got to try and claim back half of my return train ticket. The Conclaves of St Martin at Sees and Lion Rampant are pleased to announce a joint Conclave visit to Lindisfarne on Saturday 20th June 2015.